So today I started a new WordPress blog. 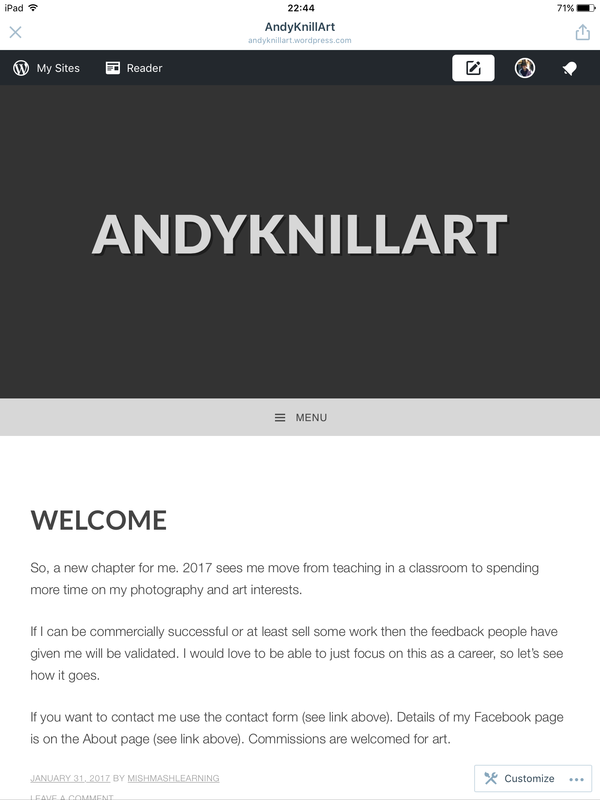 Http://AndyKnillArt.wordpress.com It will track and provide a route to tell others what I am doing, pieces produced and will link back to my Facebook page @andyknillart. 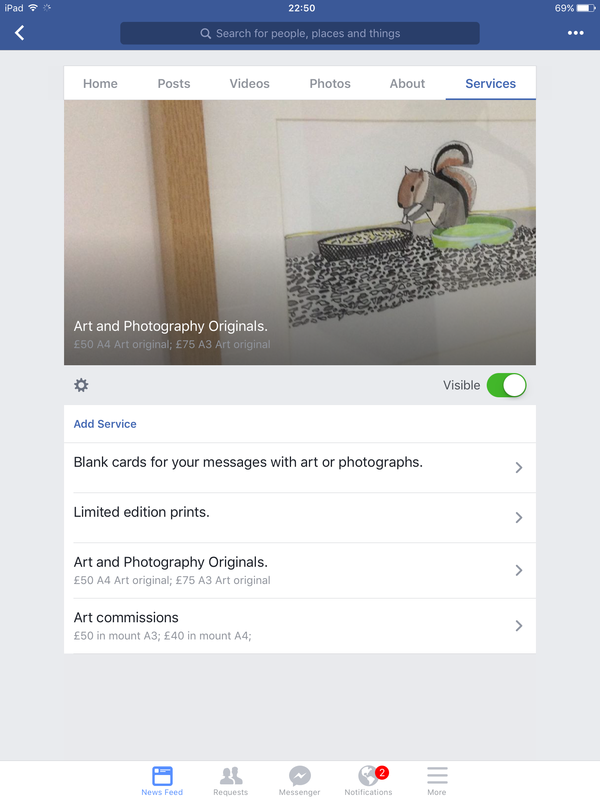 The Facebook page has also been added to and I have started to put examples of work and price ideas – please give feedback. So it’s Sunday. Yesterday was a positive day. A week in which I lost two days to very deep lows both linked to seeking support from secondary care mental health services locally, seems ridiculous that applying for help causes more uncertainty in my self esteem. However, as a couple we have fought this battle many times with social services, post adoption support … We live in a country where needs often are not or can not be supported, but to access the services that are available you have to demonstrate great #stickability which of course is difficult if you are already struggling and also on your confidence in challenging systems or professionals in their own field. 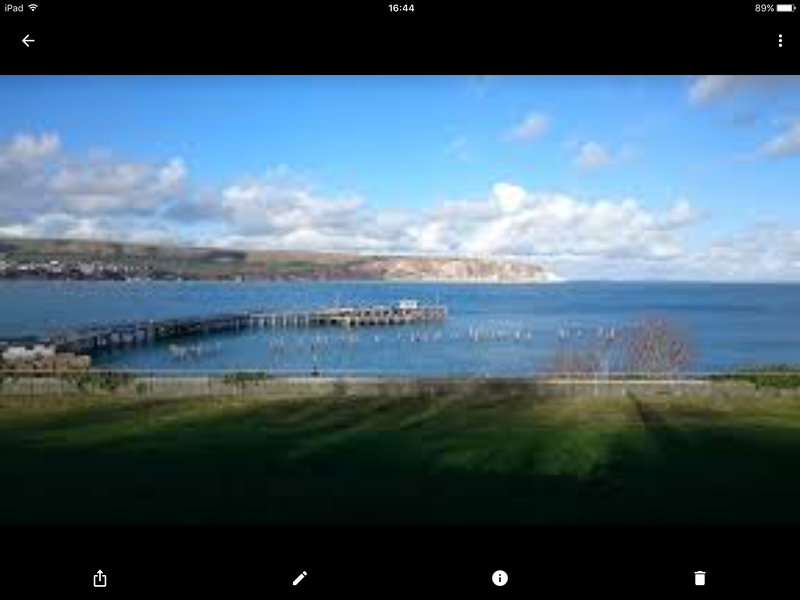 – I love Dorset and especially Purbeck. 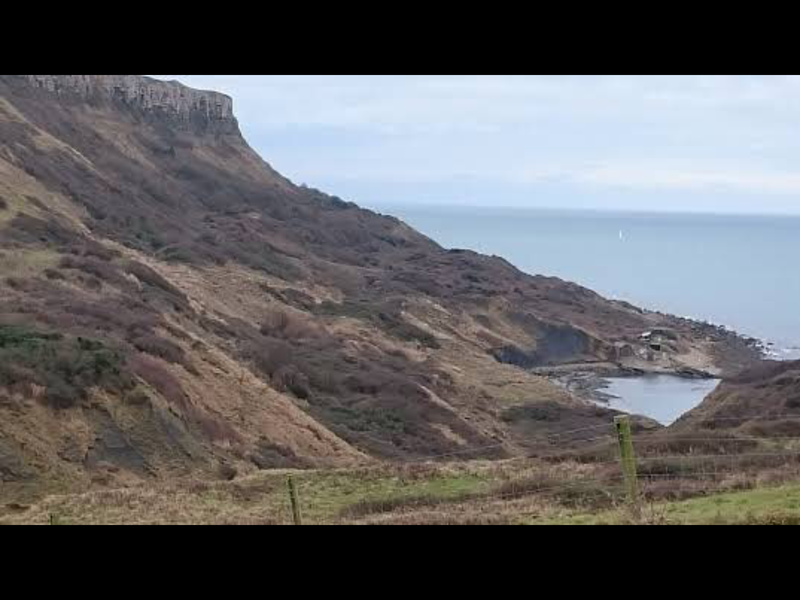 I now live in an area where countryside and coastlines are readily available and are so beautiful. My and family interests in leaving behind the suburban traffic noise we lived amongst previously are not missed. – my job here did not work out, I did not fit into a particular close knit team, c’est la vie. I loved actually teaching the pupils, I would liked to have fitted into the team but it wasn’t to be and I made the wise decision to pull back straight away in the circumstances. – I have made new friends and acquantances already by talking to people I meet and especially through the companionship I have found in the Swanage Sea Rowing Club. I get to exercise three or more times a week, I am allowed to help coach junior rowers, so the teaching aspect is still there. – at last we approach completion of the sale of our property in Essex which brought much stress and tension from July to October especially. This means we are financially stable and will be able to look forward and make choices without the burden of mortgages etc. – my wife, Anne, very sensibly suggested that after 28 years without any career break I might take a work break and readjust. I have been revisiting as constantly felt I should be back working, but having removed teaching which I have used to define myself for so long, there must be a break and I think today that I have actually accepted it. – my mental health has dived lower for an extended period than ever previously but I am working at it. Anne is being very supportive as we work at our new life together. 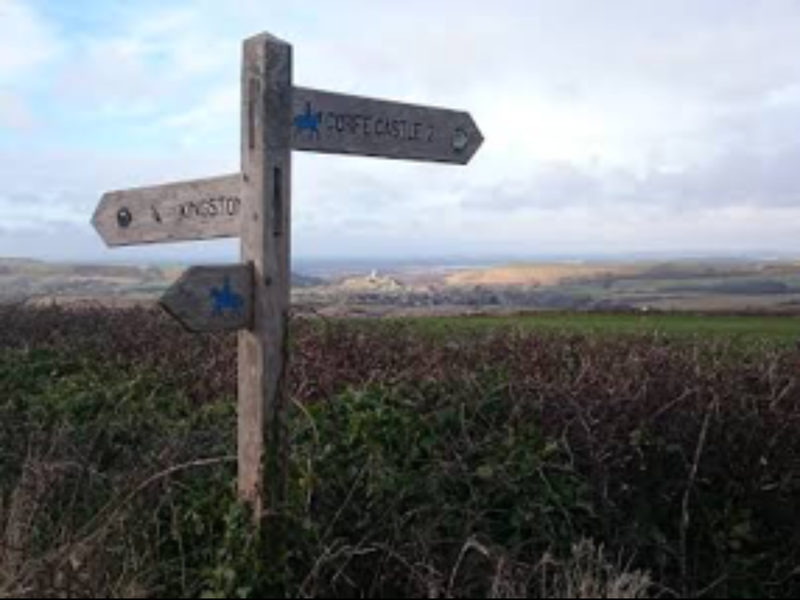 Next we apply for the local “Steps to Wellbeing” programme, we have found a very supportive GP practice in the Corfe Castle Surgery. I have joined the Swanage Depression Support Group who are a great group of people with whom I have a common demon. I am going to work to fight the suicidal thoughts and response to flee that went through my head especially in the period mid September to mid January, honesty is helping with that. – I have had an alternative therapy approach to solving shoulder issues which has made me look at how my body works in a new way and it has been a positive experience. 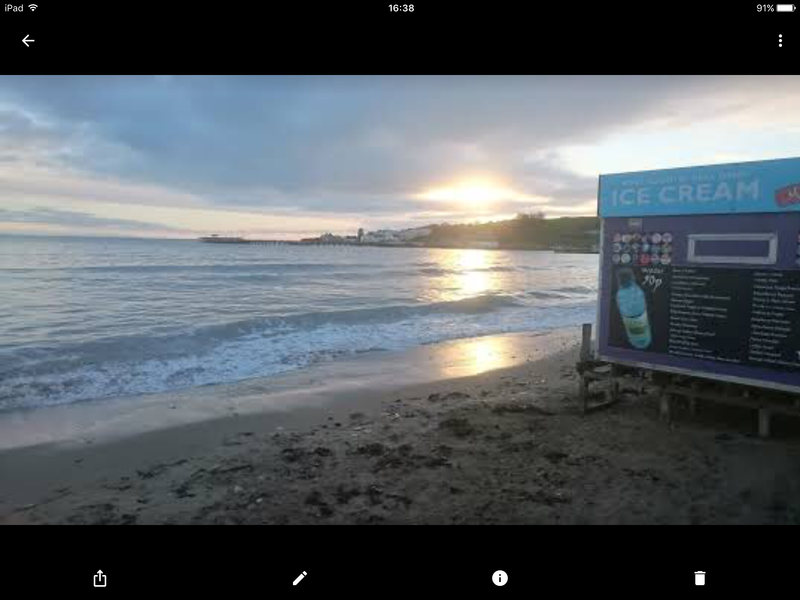 – I was given lots of supports by some of the local artists especially Sue and Kate during the pop up beach hut season on Swanage seafront in the run up to Christmas. I have booked a table for April 1 – no, it’s not a joke for @AndyKnillArt to see if others want to buy some of my photography and / or art. This idea foundered for a while with the mental health dips but I hope to see it move forward this year at whatever pace I can cope with. – we are renting for the first time and the property is fab. A dream to live in the countryside and see a range of wildlife every day,this gives a great sense of privilege. It brought its own lows at first when I was here on my own almost rattling around. Anyone know an easy foolproof way to earn a £one million so that we could stay here forever – I like it that much. 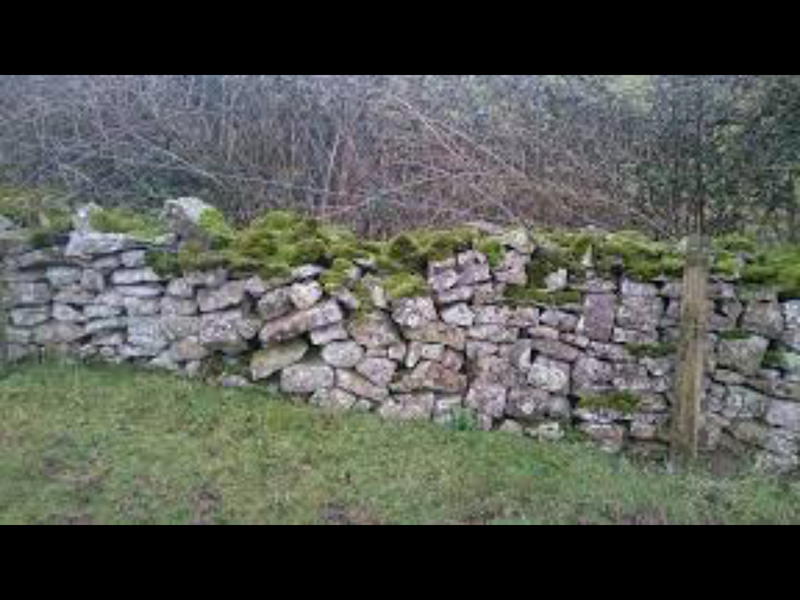 I have dug out paths long hidden under overgrown rough grass,started to look at skills I can l learn locally so that I can restore features like the drystone walls. I was going to keep a record and will do this where I will map the property as we learn more about the fauna and flora that we live amongst. 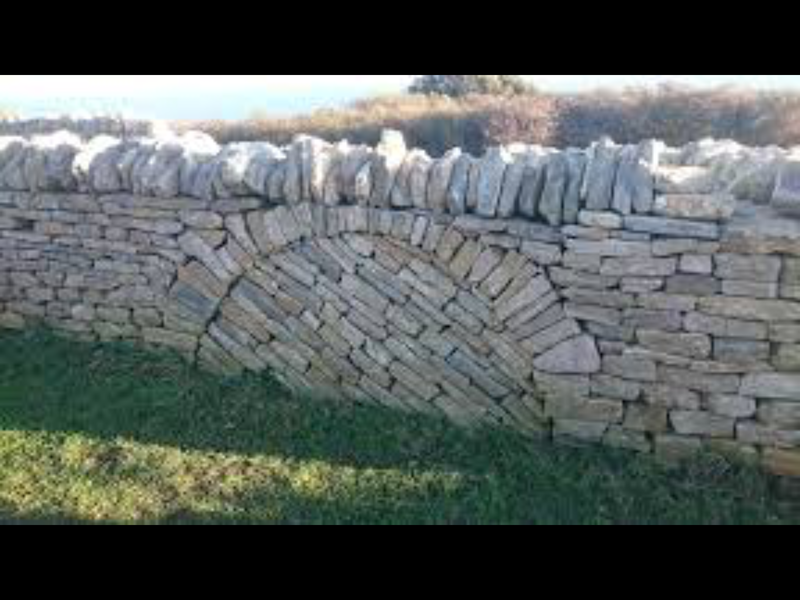 – shared places, I mentioned that we love Purbeck – from National Trust properties at Corfe Castle and Studland beach, Swanage bay and headlands at Ballard Point and Peveril Point. Durlston Castle and national nature reserve with its links to local heritage and quarrying. 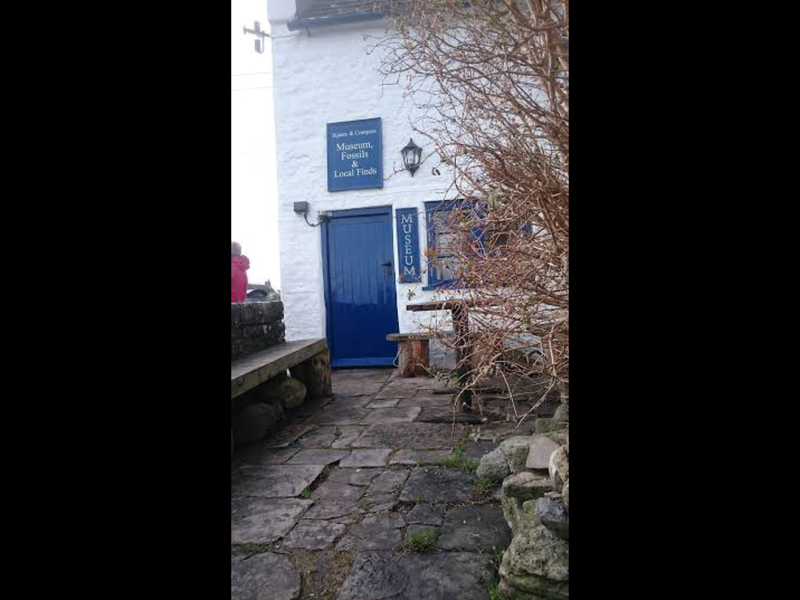 Country pubs like the Square and Compass and Scott Arms. 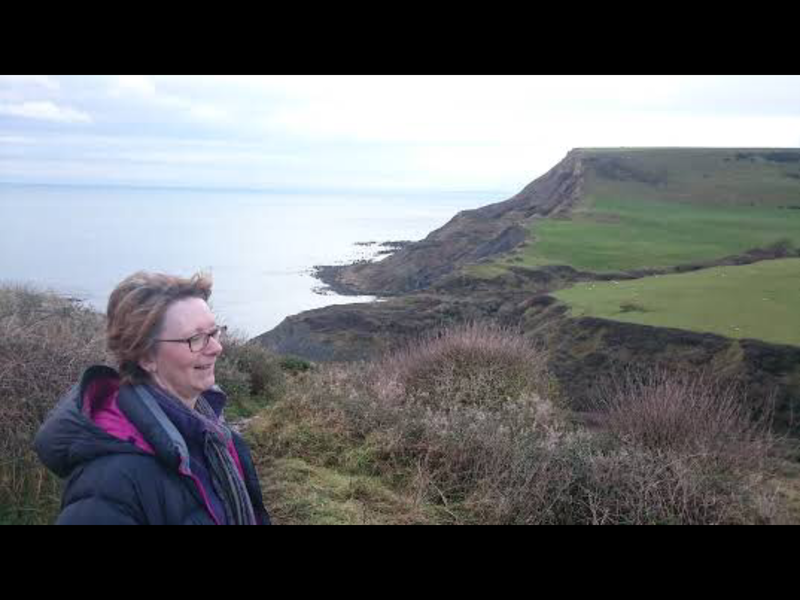 Walks out onto Houns Tout,Swyre Head where we can look out over the Jurassic coast and the local diverse geology. books again, I have joined the library, I try to be outside in the fresh air at least once every day. I stopped blogging but as you can see it is a reflective outlet, so it’s coming back like this post. Thanks for the feedback from new readers and for acquaintances from education and so on who are part of that Twitter legacy. I still use FB but cleared 400 contacts out, a more select circle that will grow again slowly I am sure but with me in a far better place to use it and keep life in perspective. Today I had my second sea swim since Christmas. This one was however after slipping over while recovering rollers at the stern of one of the rowing boats. 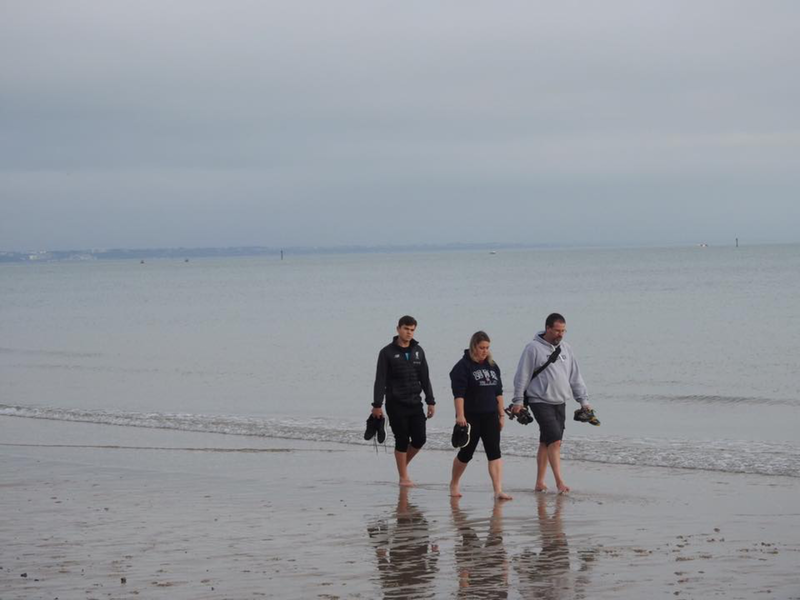 The water actually felt warmer than on Boxing Day but no loss of soh, in fact I actually enjoyed it. So I was at the boat shed by about 8.15 am, warmed up on the Erg, helped set up two boats and an hour’s row with B team and first time out in a wooden gig. Several aspects to work on, but sunshine, fresh air and sea makes a great pick me up to start the day. This afternoon a walk in Swanage out to Peveril Point where more of the sloping beds were exposed, then a drive up to and walk at Durlston to see if there were groups of seabirds as had been reported on fb the last two days, several gulls seen gliding in and around the cliffs and several sightings of cormorants / shags flying out over the water. Now feet up watching the garden for pheasants, squirrels and any other wildlife. It’s Friday, it’s the evening and in London’s Docklands I am aware that many friends and acquaintances will be / have been gathered for the TMBETT17 or similarly titled event, then on for a meal where there will be lots of animated talk…. Just a short greeting to the people who I have spent many hours chatting with online and at a variety of ed events. I am now away from that as no longer employed in education. In lucid happier moments I miss the camaraderie but not the stress. Several of you said to me back in November, since my sudden departure and since, how my experience would be valuable to others, but to be honest while generally more invisible online these last three weeks it is not an avenue that I will be able to explore for a long time if at all. Like the pupils I only met for 10 weeks and many more previously it’s the people I miss but at the moment I am not always comfortable around others..
My personal post classroom journey is ongoing and I seem to have decided this week to let my blogpost speak out once more. For GeoDebs I am still recording a daily GOB journal entry but not blogging it. If / when you leave teaching try to make it a controlled departure where you have control and a plan in place. Just jumping out is what I did but at some personal cost that I am still living through. So why did I post? To say hi really, so hello to all of you who have visited BETT or will be attending tomorrow in your own time / own expense. If we have been in contact previously I hope work is going ok or better and if it isn’t make sure you have others to talk to, offload to etc. Make time for you and yours and look out for each other. Today I had my second meeting with Community Mental Health locally to see if I could / should access the secondary level resoutces. I have been extremely anxious about this twice this week. I rang on Wednesday to see if there was an outcome from the previous meeting 15 days before. I couldn’t take the call and Anne had to take over as I was so anxious. Today I received a copy of a letter they had sent out 3 days after my appointment but not told me – cue anxiety. I was very nervy today. Expecting same outcome but completely wiped out by it. Just an update I suppose. Yesterday rollercoaster dive,this morning we knew the electricity was going off at 9, so until a visitor had been, I was working by natural light only. I produced some templates / shadow silhouettes of three views from the house that I can use to record the various spectacular colours we get at sunrise / Sunset. Very productive and pleased with the outcomes. I had messed about with iOS app Art set last night when unable to sleep and did a marker and oil pastel version of a recent sunrise that was fresh in my mind. This has led to an idea on other Dorset landmarks close by that I could use for a range of skies including Corfe Castle. Two of silhouettes produced with freehand drawing using fine nib on Promarker and then shaded using chisel nib. We then went out and visited a few places returning home in time to wash the Yeti down which I had squashed in a sketch of the cars this morning. I feel tired but enjoying finding energy to do things. I have also agreed to have a table at a craft fair in Swanage on April 1 – so I will need to be producing goods and getting this @AndyKnillArt idea rolling. Details as it happens. So, it’s Wednesday 25 January and later I will note some positives for today. I won’t dwell on the negatives or record these as I have done in previous years in blogs. My GOB (Glimpses of Brilliance) journal will continue to be recorded in. It’s already good to look back knowing that life has been like a rollercoaster of emotions already this year for a variety of reasons but my record shows the positive thoughts. In reality however mere trifles like following up an appointment from two weeks ago, to the very team you would hope can help causes an emotional crumple, full body shakes, confidence to speak on the phone goes, curled in a ball, crying my eyes out and the loss of most of a day that had started positively. Yes, my life has positives but there are so many things in my heart and mind that are unresolved, uncertain of what they are, how they are. I have plans for a future with family but the rest is a haze. Anything teaching related and quite a lot even geography related is too painful. Why post this blog? Because it’s another record I might come back to in the future when in a better state. The viewing figures are down but considering I am no longer on twitter that removed a huge potential audience. Is this really meant for others to read? I could make it private? Oh well if you normally read my posts you may have some insights. Well, I have now been keeping my GOB journal / diary for 3 weeks and every day contains at least one positive, most days include a range of activities or outcomes that can be seen as positive. I have taken my journal to two support group meetings on the 4th and 18th. I have recorded some of the negatives as context or where fight / flight impulses have been felt. Actions including drastically reducing my time on social media are working gradually. I have returned to reading my library book and hope to finish a few before the extended return date is reached. I am pacing myself when it comes to rowing sessions as my fitness has increased but needs to go much further. My physical therapy is noticeably helping and this week I have breathing exercises to work on which is an area I have been very aware of needing to address. Seeing the few online contacts I have discussing events like BETT (UK educational IT show) which I have no interest in anymore and a local vacancy for a field tutor role which previously I might have jumped at. I have seen some seasonal vacancies start to be advertised and have made enquiries and have applications to complete. Overall my mood is better than it was 12 days ago (not so long ago!! ), but I am still having large dips in mood on occasions. I am doing my best to be mindful that these are in the minority. Apologies to friends for whom I disappeared from social media without notice it was due to a realisation that it was taking up too much of my time and was not helping my state of mind. I admit that I am not missing Twitter, several people on it, but not the whole experience. So this is an update and I will post these occasionally as I continue with my journal. There have been some aspects of personal clarity that I am not going to share but I am working on these to help myself going forwards. Just to report that life has improved a lot since Monday 9 Jan. Lots of talking, honesty and taking time. Not completely offline but vastly reduced. Twitter has gone. 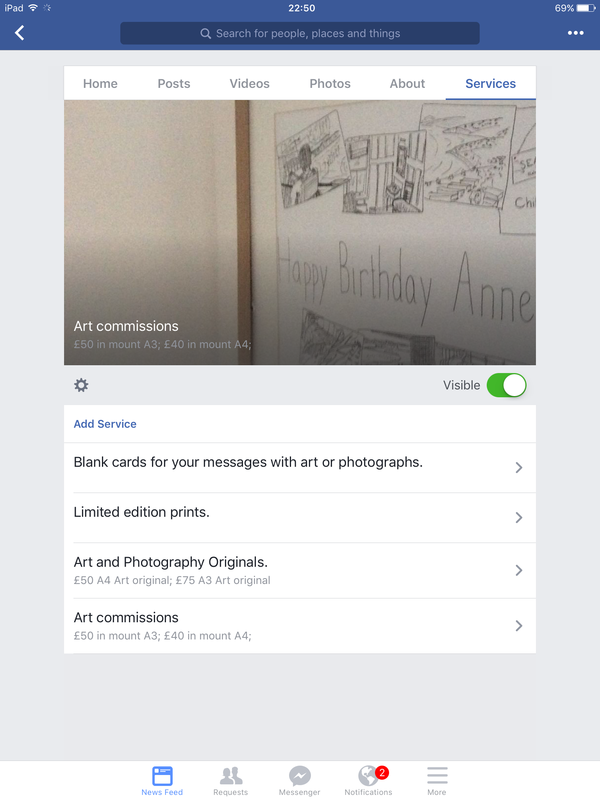 FB vastly reduced. I wasn’t going to blog for a long time but some have got in contact re. my disappearance online generally. A week of deep lows and recovery towards a much better position. Deep fall off in MH. Trigger known but not for blog discussion. I was at lowest in memory. Anne got me a gp appointment which I agreed to attend. I was shaking like a large branch in a storm, no gentle leaf fluttering. I agreed to see Community Mental Health Team as even keeping eye contact was almost impossible and I was not in a safe state of mind. I came off social media and wiped ‘000s off my gross follower total. Twitter accounts are now gone. FB went from over 400 to 28, mainly family and some very key MH supporters. The GOB diary has continued, there were a couple of positives even on such a bleak day. Lots of chat at home and research behind trigger factor. More positive. Attended CMHT assessment and spoke honestly. Await outcome. Time spent out on some retail therapy – chisels and food. More positive. There are still certain triggers that reduce me to a shakey wreck. More GOB positives each day. Saw gp and able to demonstrate how things had picked up. Even went down to row club in evening to drop off some sweets, but I felt immediately at ease and stayed and trained including more of the circuits completed and a 5k row in 20m 55s, went off too fast and at half way stopped for about 90 secs. Retail therapy – Charlie came out with us too. First to canoe shop and new paddling attire for three, lots of trying on and coping to put on then remove items with neoprene cuffs etc. Lunch at Costa bought by Charlie. Onwards to look at a Yeti – test drove and liked so another purchase initiated. On return journey saw a Defender I had spotted on AutoTrader app. Expensive for year / mileage but lots of toys. Spent too much time online last two to three days on cars rather than social media but something to watch. All three to Swanage together a.m.. Charlie dropped at railway. Was down to row at 10 but so cold not enough to crew boat available but did help put boat away and got feet wet too. Great coffee and natter in High Street Cafe and Anne came so met number of club. Afternoon did some garden digging, about 4 barrow loads. As missed row yesterday asked if space for today. So leave home 07.30, on water for about an hour – now favour seat 1. Cafe again afterwards. Home, Anne wanted some exercise so we decided to go through estate and down South Street towards Chapmans Pool. Too muddy to get all the way, so up slope and over to Worth Matravera – steak pasty, and drink then easier route back along road. Measured once home – about 6.5 miles. Rest and decide to blog.